At Skin Renewal we pride ourselves on visible results. As an aesthetic clinic we offer problem specific add on treatments as an addition to our peels to ensure amazing results. If you feel that your skin requires more intensive treatments please schedule an appointment with the aesthetic doctor to determine which medical aesthetic treatment should be prescribed. Every client is provided with a fully customised solution dependant on the patient’s age, relevant skin problem, budget and expectations. At Skin Renewal, all patients with skin conditions are treated holistically by our qualified medical doctors who have experience in treating acne. In other words, in an acne consultation at Skin Renewal, your doctor will take a comprehensive history to ensure that there are no underlying medical conditions which are contributing to your acne. Mild acne can be treated with the Clarity range from Lamelle which is available at all Skin Renewal branches. For mild acne a doctor's consultation is not necessary and the Clarity range and Acnevelle or Neostrata range may be purchased from the skin professionals at all Skin Renewal branches. If you suffer from moderate to severe acne (many lesions) a consultation with one of the Skin or Health Renewal doctors is mandatory as a customised treatment package will be designed for your condition. 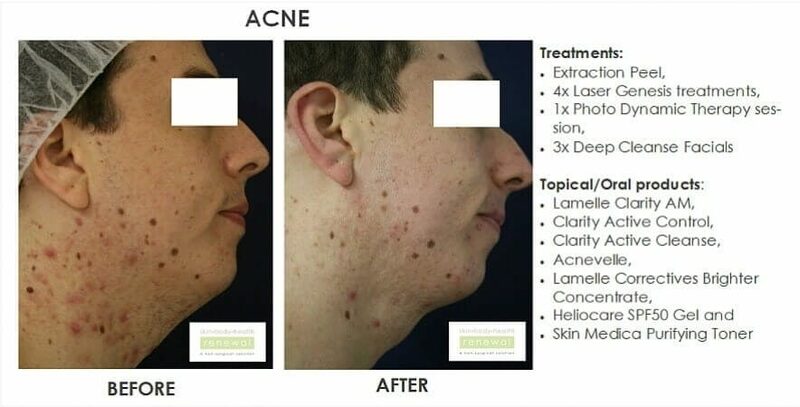 Are Acne treatments available at all Health Renewal branches ? 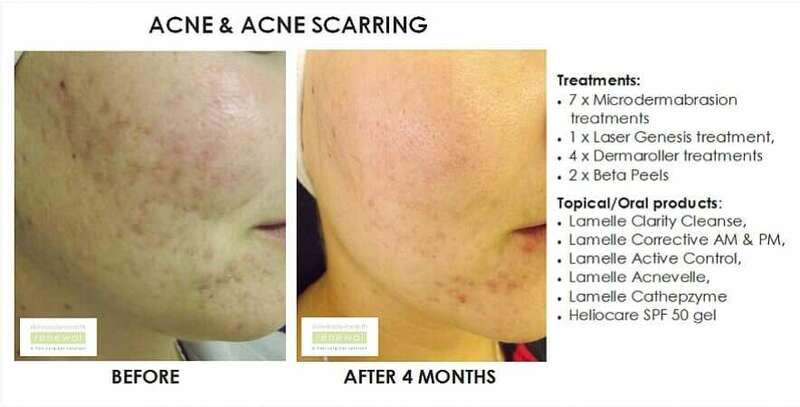 Acne treatments are available in Johannesburg, Sandton and Pretoria at the Morningside, Parkhurst, Bedfordview, Fourways, West Rand , Illovo, Irene, Brooklyn as well as in the Western Cape at Cape Quarter, Claremont, Constantia, Stellenbosch, Paarl and Willowbridge branches and in KZN at Durban & Umhlanga. 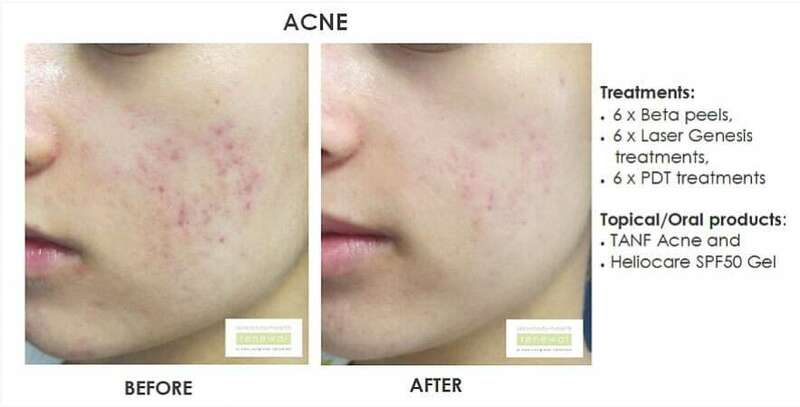 Why choose Skin Renewal for your acne treatments? There are numerous significant medical conditions that are associated with acne that need to be identified and addressed. Conditions such as low stomach acid, dysbiosis and leaky gut all compromise skin but more importantly which have future health ramifications such as auto immune disease, food sensitivities, allergies, asthma, depression and even cancer if they are not adequately addressed. In addition, low stomach will eventually lead to low levels of Zinc and other important minerals and vitamins which are essential for good healthy skin. Why does your Skin Renewal doctor check for low stomach acid during your consultation for acne? Adequate stomach acid is essential for absorption of the minerals zinc, magnesium, calcium, iron and folate which are essential for healthy skin. Adequate Stomach acid prevents dysbiosis. Adequate stomach acid will help prevent a "leaky gut "with all its health ramifications from developing. Adequate stomach acid is necessary for the absorption of the B vitamins. Stomach acid activates protein-digesting enzymes and is necessary for proper digestion of protein. Adequate stomach acid is necessary for the pancreas to release its cascade of digestive enzymes for absorption of carbohydrate and fat. Sub-optimal fat digestion means we won't benefit from the anti-inflammatory properties of omega-3 fats,nor the wide array of beneficial effects of fats for fertility, skin health, immunity, etc. Adequate stomach acid destroys pathogens (bacteria, fungi, parasites etc) and a lack of stomach acid can lead to bad bacteria proliferating in the small intestine dysbiosis (bad bacteria) and unwanted parasites which have Health Renewal ramifications down the line. How can we expect to stay healthy and have healthy skin without constant breakouts and other Skin, Body or Health Renewal conditions if we have chronically poor nutrient and mineral absorption due to incomplete digestion? Having normal levels of stomach function the first important domino in a row of dominos: If stomach acid is adequate, the rest of one's digestion and absorption won't be compromised and the first domino won't fall and immune dysfunction is less likely down the line. If digestion in the stomach is compromised due to low stomach acid, then the fall of the first domino will occur and the breakdown and absorption of nutrients in the stomach and beyond won't be optimal. In fact, digestion and absorption can be reduced to the point where even if someone is consuming a nutrient-dense diet, they can suffer both sub-clinical and overt deficiencies because they're not assimilating those nutrients because they have low stomach acid. Get your stomach acid checked by our Skin Renewal Doctors. Acne (acne vulgaris) is a dermatologic condition which affects approximately 80-95% of adolescents as their bodies go through puberty, but luckily its occurrence declines over the following years until middle age. This condition is characterized by lesions that most often appear on the face and neck, but it is not uncommon to develop these lesions on the chest, back, shoulders and upper arms too. Acne vulgaris, the most common skin disorder, affects virtually all individuals at least once. Incidence peaks in 18-year-olds, but substantial numbers of 20- to 40-year age group also develop the disease. Adolescent boys and young men are more likely to have acne than their female counterparts and make up the majority of severe scarring cases, due to the fact that acne is triggered by androgens (male hormone) fluctuations. Women are more likely to suffer from ongoing acne that commences or reappears during their early adult years. Around 8% of women have acne persisting into their 30’s and in some it continues into their 40's and occasionally 50's. Why this occurs is poorly understood but may be related to hormones, childbirth, menopause, or stopping the pill. Adult women may be treated at the period and at ovulation when acne is especially severe, or throughout the entire cycle. There is also a subset of women with “true” hormonal acne who have abnormal levels of androgenic (male-type) hormones. These women often have accompanying excess facial hair (also hormonally regulated) and irregular menstrual cycles, although women who have normal hormone levels may also have excess hair. The sebaceous glands of patients with acne are likely to be hypersensitive to androgens (male-type) hormones. What are the important psychological aspects of acne? The effects of acne should not be underestimated. It can persist for years; produce disfigurement and permanent scarring; and have significant psycho-social consequences, including diminished self-esteem, embarrassment, social withdrawal, depression, anxiety and unemployment. The extent and severity of these effects underline the importance of providing adequate therapy, such as the Clarity range by Lamelle which produces more than 80% improvement in 8 weeks in mild to moderate cases. Acne is characterized by the formation of comedones (blackheads), pimples, cysts and abscesses (in worst cases). These lesions are formed on the skin when the pores in the skin are blocked. This blockage causes oil to be trapped, together with dead skin and bacteria within the hair follicles. In normal circumstances, the sebaceous glands (which have the function of secreting an oily substance called sebum) are attached to the hair follicles and allows the sebum to travel up the hair follicle and onto the skin. However, if there is a blockage in the hair follicle, the sebum can't get out, and this can sometimes cause the formation of a blackhead (comedones). Blackheads are the result of the blocked oil that oxidizes, causing further inflammation and an influx of white blood cells. Meanwhile, normally present bacteria (Propionibacterium acnes) begin to break down the trapped sebum within the hair follicle. The subsequent result is further and aggravated inflammation, as white blood cells attack the bacteria. Pus forms within the lesion causing the lesion to enter the whitehead stage. In more severe stages with severe inflammation and infection, an abscess - a painful pus-filled pocket within the skin - may form. What is the Pathogenesis of acne: A Summary? 1. Dead skin cells blocking the oil duct results in Comedogenesis. The first sign of altered keratinization is a blackhead which consists of keratinized material and lipid material. This Abnormal Keratinization results in formation of keratin plugs which blocks off the drainage of the sebaceous follicles, leading to accumulation of inflammatory debris and increased bacterial numbers of P acnes. 2. Too much oil production caused by androgenic hormonal stimulation of sebaceous glands at puberty or later (hormonal triggers). 3. Too many bacteria: Proliferation of P acnes in this blocked follicle. 4. Too much Inflammation: is a direct or indirect result of P acnes proliferation. Rupture of the inflammatory follicle onto the skin results in the redness around the acne lesion. Extension of inflammation into the skin results in formation of the inflammatory lesions of acne, which include papules, pustules, and nodules. The result is redness and pus. What are additional causes that have been associated with the development of acne? Hormones; In both men and women, the androgen hormones are present in much higher concentrations at puberty and acne results. Polycystic Ovarian Syndrome (PCOS) leads to higher levels of male hormones which can cause acne in female patients. Flare Factors for acne are: stress and depression, menses and puberty (new onset hormones). Environmental factors such as high humidity causing swelling of the skin. Diet: a poor, unhealthy diet high in saturated fats, MSG's and preservatives can aggravate acne in someone who is allready prone to this condition. Cosmetics especially certain moisturizers and foundations. What skin care ingredients must one AVOID if you have acne? 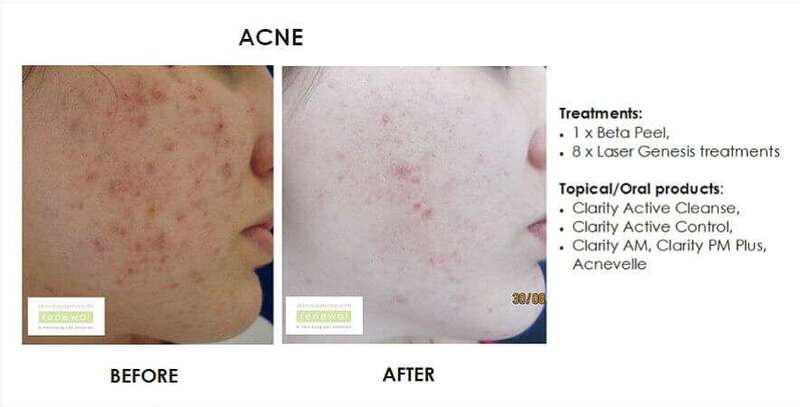 How can acne be classified? Acne can be classified as mild, moderate or severe inflammatory acne and is based on lesion count and whether nodules are present, or not. Mild to moderate acne has papules, pustules and comedones, without any nodules present in the skin. Severe acne has many papules, pustules, comedones and/or more than 5 nodules present in the skin. Cysts may also be present in these severe cases. Severe acne may be more common in males and this kind of acne should be referred to a Skin Renewal doctor as scarring is inevitable. What are the types of Acne lesions? Open comedones (blackheads): These lesions are very common and consist of dilated pores and/or hair folicles , that are filled with a combination of sebum, dead skin cells and bacteria. This mixture gets trapped within the follicle creating a central, dark and solid plug. The follicles are not completely blocked, and it appears black because of oxidation of the trapped mixture, not dirt. Closed comedones (whiteheads): These form when the dead skin cells and sebum completely block the opening of a hair follicle, usually following after a blackhead has formed. Pustules: This whitehead type of lesions is pus-filled and inflamed. Once these lesions rupture into the skin, they form pustular heads. Papules: This type of whitehead (5 mm or less) is a type of lesions that has become swollen, red and inflamed. Nodules: This type of lesions is a solid, dome- or irregularly shaped, inflamed lesions that extend deep into the skin. If left untreated these lesions can cause tissue damage and scarring because it affects deeper skin layers too. This type of nodular acne is the most severe form of the condition and can be very painful, even without touch. Cysts: These sac-like lesions contain a liquid, or semi-liquid, substance that is made up of white blood cells, bacteria and dead skin cells. Left untreated they can result in scarring, and may be very painful and severely inflamed. When an individual has the formation of cysts and nodules together it is called nodulocystic acne, which is also very severe and requires medical treatment. Acne can be caused by both environmental and genetic factors, but genetics seems to the predominate cause of the condition in most individuals. It was found in one large twin study that 81% of disease variance (that is, the difference from what would normally be expected) was attributed to genetic effects, and the remaining 19% to environmental factors. Furthermore the study also showed that if an individual has a family history of acne it significantly increased personal risk of developing the condition. Puberty is the stage in a person’s life when there is an increase in the production of the male hormone testosterone (in both men & woman) which leads to the enlargement of the sebaceous glands in the skin and creates a contributing factor to acne formation. If the sebaceous glands are enlarged they produce more sebum, which leads to the aforementioned plug formation, and this then creates a fertile environment in which bacteria can grow and multiply. Unlike male-hormones (androgens), female-hormones (estrogens) have a beneficial effect on acne, this is then why some doctors recommend the use of birth control pills for women who have acne. However, when a woman's estrogen levels decline acne may worsen (this drop in the hormone levels happen each month just before the menstrual cycle begins). Acne or acne-like lesions can also develop in response to various substances, including corticosteroids, lithium, and some psychotropic drugs. There are also other environmental causes such as exposure to tobacco smoke, coal tar derivatives and industrial oils which need to be steered clear of. Substances to also avoid include oils in aerosol sprays, as well as excessive washing or scrubbing of the skin. Over washing can aggravate acne because it causes increased skin-oil production leading to more acne formation. There are types of cosmetics, oil-based hair products, and suntan lotions which can block oil glands and worsen acne so they are best avoided. It is better to use hypoallergenic, oil-free and water-based products that do not clog pores. It is interesting to note that, despite popular opinion, the conventional medical view is that acne is not caused by poor hygiene or by eating specific foods, such as chocolate, pizza, and soda although the evidence is mixed. What are the additional causes of Acne? An individual’s diet has long been suspected as a contributor to acne. It is believed by many people that foods such as greasy pizza, chocolate and refined sugars cause acne and worsen the condition. Meanwhile, the conventional dermatological community is adamant that diet does not contribute to acne, dismissing most dietary concerns as myths. There are however a few well-designed scientific studies which found that the truth is probably somewhere between these two extremes relating to diet. There is some very initial evidence that a diet with a high glycemic index (which simply means it contributes to high levels of glucose in the blood) may contribute to acne. In one small study it was found that by avoiding glycemia-inducing foods, "some results appeared promising," but that the small sample size (consisting of only 11 young men aged 15 to 20) was not enough to draw significant conclusions. Another study examined the role of dairy consumption in acne cases. This was a very large study that included questionnaires submitted by more than 47,000 high-school-age women (14-18years old), and found a positive correlation between acne and total milk and skim milk consumption. It was speculated that the association may be due to hormones and bioactive molecules found in dairy milk. Other studies have confirmed that the Western diet in general, which is high in fats, refined carbohydrates, and sugar, is conducive to acne. 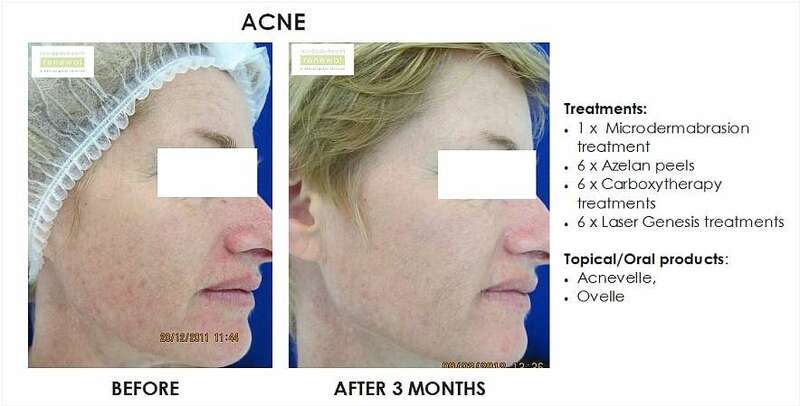 Why does conventional medicine sometimes fail in efforts to prevent acne? It is clear that there are multiple causes and contributing factors that cause the onset and progression of acne. Conventional medicine has many powerful drugs that could be used and helpful in treating acne, but they only address one of those factors. It is also possible that these can cause various side effects which could be harmful and create further complications. What neutraceuticals will be recommended? It is the choice of the individual to use natural and alternative therapies in the treatment of acne, either by itself, or to compliment conventional medications. These natural remedies can help to reduce inflammation, and infection, and in severe cases a combination of treatment might get the best results. Vitamins A and E. The benefits of vitamins A and E in acne treatment was highlighted in a study in which investigators compared the plasma vitamin A and E concentrations in 100 untreated patients with acne, compared with 100 healthy controls. In the patients that suffered from acne the plasma concentrations of both vitamins were significantly lower than those of the healthy individuals. This showed a strong relationship between a decline in vitamin A and E levels and an increase in the severity of acne. These findings supports previous research which found that supplementation with vitamin A is beneficial in inflammatory conditions, including acne. Equally, vitamin A deficiency induces inflammation and aggravates existing inflammatory conditions. In fact, vitamin A in its retinoid form has long been an important treatment for acne. Lipoic acid. It has been tested for several decades how effective lipoic acid is in the treatment of acne. Reportedly, lipoic acid activates a factor in the body known as AP-1, which produces enzymes that digest damaged collagen and helps erase scars, including acne scars. Topical ointments that contain lipoic acid as an ingredient can assist in improving scarring, and this can be taken in oral supplements as well. Zinc. This mineral is very potent in the treatment of acne as it appears to perform a threefold role. Firstly Zinc can help to reduce inflammation, secondly it kills Propionibacterium acnes (the main bacteria associated with the condition), and lastly zinc produces changes in the skin environment that make it more hostile to this bacterium for a longer time. A two-month study of the efficacy of zinc gluconate (30 mg once daily) in 30 patients with inflammatory acne showed a reduction in the number of inflammatory lesions after the treatment period, and improved effectiveness of the antibiotic erythromycin among patients with antibiotic-resistant organisms. In a double-blind study, a combination of 1.2% zinc and 4% erythromycin in a topical lotion was used by 14 individuals with acne. It was founds that the combination of zinc and erythromycin significantly reduced secretion of sebum after six weeks of treatment. Further, a topical preparation of zinc acetate was found to prolong the duration of erythromycin on skin, potentially overcoming some mechanisms of erythromycin resistance. It is very interesting to note that clinical trials of zinc preparations have demonstrated their equivalence to antibiotics, with the added benefit of having more convenient dosing schedules, and less harmful effects of antibiotic treatment. A study that compared a cream containing chloroxylenol and zinc oxide showed no difference in efficacy compared with 5% benzoyl peroxide, but it did find significantly less skin drying and irritation with the zinc-containing cream. Finally, a 2005 study demonstrated that a gel containing clindamycin plus zinc, applied once or twice daily, achieved the same benefit obtained by clindamycin lotion alone used twice daily. Niacinamide (nicotinamide). Niacinamide is one of the two principle forms of niacin, and proves to be very effective in acne treatment when applied topically to the skin. In a State University of New York study, a 4% nicotinamide gel was compared to a 1%clindamycin gel for the treatment of moderate inflammatory acne in 76 patients. Treatment was applied twice daily for eight weeks. At the end of treatment, 82% of the nicotinamide patients and 68% of the clindamycin patients were improved. An additional fact to keep in mind with the use of topical clindamycin is that it is also associated with the development of resistant microorganisms, which makes the use of niacinamide even more preferred. Nicotinamide cream has also been shown to reduce the amount of sebum present on the skin, thus assisting in acne treatment. Essential Fatty Acids (EPA /DHA). The two omega-3 fatty acids, eicosapentaenoic acid (EPA) and docosahexaenoic acid (DHA), are well-known tried & tested anti-inflammatories that have been shown in dozens of studies to reduce general inflammation. Although their effect on acne and skin inflammation has not yet been extensively studied, their ability to reduce inflammation in general suggests they might be beneficial with a role in the treatment of acne. Several studies have found that omega-3 fatty acids are absorbed through the skin and can reduce inflammation in a particular area. Herbal Therapy. Even though herbal therapy is often suggested for acne, there are few controlled scientific studies that have been conducted to confirm any claims. In a double-blind, placebo-controlled clinical trial of Ayurvedic (ancient Hindu) herbal preparations, researchers randomly assigned either placebo or one of four Ayurvedic formulas to 82 people with moderate cases of acne. One formulation, Sunder Vati, significantly reduced the number of inflammatory and non-inflammatory acne lesions. Sunder Vati consists of a combination of ginger (Zingiber officinale), Holarrhena antidysenterica, and Embelia ribes. Several other herbs have anti-inflammatory properties that may be helpful in the treatment of skin conditions, although there are no scientific studies that have been performed with acne. The herbs include calendula (Calendula officinalis), German chamomile (Matricaria recutita), witch hazel (Hamamelis virginiana), and licorice root (Glycyrrhiza glabra). These herbs are found in some natural skin-care products, and may be effective on an individual basis. What are the risks and complications of acne and its management? If an individual chooses to use aggressive dietary supplementation it should be discussed and supervised by a qualified physician. Several of the nutrients suggested in this protocol may have adverse effects. Consult your doctor before taking EPA/DHA if you take warfarin (Coumadin). Taking EPA/DHA with warfarin may increase the risk of bleeding. Discontinue using EPA/DHA a minimum of two weeks before any surgical procedure, to prevent excess bleeding. Consult your doctor before taking lipoic acid if you have diabetes and glucose intolerance. Monitor your blood glucose level frequently. Lipoic acid may lower blood glucose levels. Tea Tree can cause contact dermatitis (skin irritation), so use in moderation and apply a test patch first. Do not take vitamin A if you are pregnant, or plan to fall pregnant in the next year, or breast feeding or have hypervitaminosis A. Do not take vitamin A if you take retinoids or retinoid analogues (such as acitretin, all-trans-retinoic acid, bexarotene, etretinate, and isotretinoin). Vitamin A can add to the toxicity of these drugs, causing serious adverse reactions. Do not take large amounts of vitamin A, dosage should be small and controlled. Taking large amounts of vitamin A such as Roaccutane may cause acute or chronic toxicity. Early signs and symptoms of chronic toxicity include dry, rough skin; cracked lips; sparse, coarse hair; and loss of hair from the eyebrows. Later signs and symptoms of toxicity include irritability, headache, pseudotumor cerebri (benign intracranial hypertension), elevated serum liver enzymes, reversible non-cirrhotic portal high blood pressure, fibrosis and cirrhosis of the liver, and death from liver failure. If you are taking anti-coagulant or anti-platelet medications, or have a bleeding disorder, consult your healthcare provider before taking this product, to ensure no adverse reactions will follow. High doses of zinc (above 30 milligrams daily) can cause adverse reactions. Zinc can cause a metallic taste, headache, drowsiness, and gastrointestinal symptoms such as nausea and diarrhea when too much is consumed. High doses of zinc can lead to copper deficiency and hypochromic microcytic anemia secondary to zinc-induced copper deficiency. High doses of zinc may suppress the immune system. Acne can damage the dermis (the layer of skin just underneath the epidermis) which could lead to permanent scarring. What topical treatments are available at Skin Renewal to address acne concerns? as well as Antibiotics and prescription medicines if indicated. What are the In-Office treatments available at Skin Renewal to treat and improve the post healing acne scarring? Microdermabrasion gently polishes the skin. Can be used for mild acne, where the lesions are not currently active. Deep Cleanse Facials are cleansing facials which are prescribed once a month to remove pustules and comedones so as to facilitate healing of the acne condition with as little damage to the skin as possible. An Extraction Peel is a Beta Salicylic acid peel combined with a Deep Cleanse Facial. At Skin Renewal we offer the following peels for our acne patients: Beta Salicylic acid peel, Azelan and TCA peels for our acne patients depending on Skin Type, severity and budget. The Laser Genesis procedure, a 5 in one treatment, reduces the size of the sebaceous gland, reduces inflammation in the papule and nodule, reduces pore size, improves acne scarring and pigmentation. For deep nodules, the Titan is a deep infra red laser/Light procedure that reduces inflammation and kills the bacteria in the deep painful nodule(s) and helps prevent scarring. 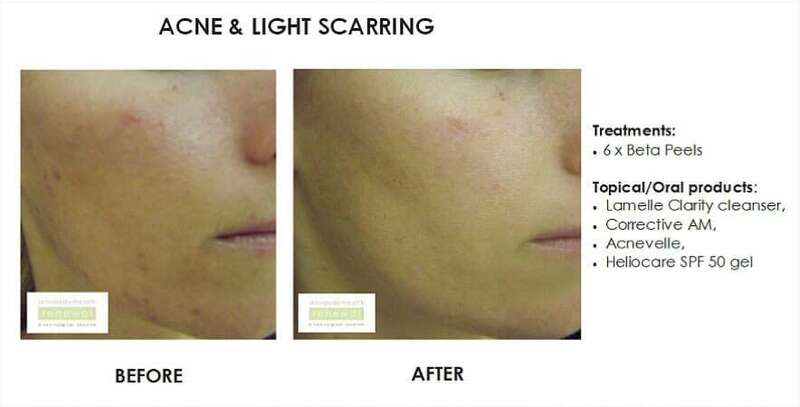 10 or 15% TCA Peel overlays to the affected areas improves the active acne lesion as well as improving PIH and acne scarring. 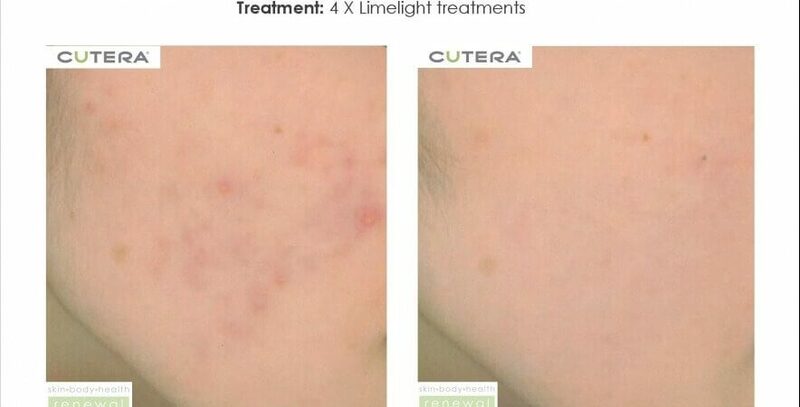 PDT/LED photo dynamic therapy uses red and blue light therapy, plus a salicylic acid silk peel to improve acne by destroying bacteria and reducing inflammation in the acne lesion. Standalone PDT/ LED treatment alternating with the red and the blue light every 48 hours. 8 treatments would be needed to improve acne. The blue light kills the acne bacteria. The red light is anti inflammatory. Carboxytherapy around acne lesions, or into acne scars, reduces the acne lesion and improves the acne scarring. Intralesional steroids into acne nodules reduce the acne lesion by decreasing inflammation. As each patient's case is different we will tailor a treatment program specifically for your circumstances and budget. A highly professional team led by a Medical Doctor assesses every patient and an appropriate combination treatment together with long term maintenance program is recommended. 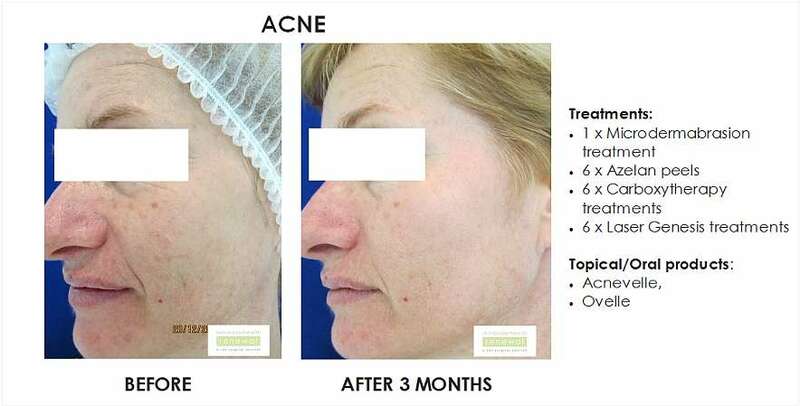 Why must nodular/severe acne be seen by one of the Health Renewal doctors? Nodular/Severe acne must be seen by our integrative medical doctors at Health Renewal for further assessment and work up and laboratory tests. Often in these severe cases there are other contributing factors that also need to be treated along with the acne. What are the goals of successful acne topical treatments such as Clarity? treating lesions and preventing new lesions from developing. Topical treatment – Clarity is indicated for patients with non-inflammatory comedones or mild to moderate inflammatory acne. Medications used in topical treatment may act primarily against comedones (comedolytic agents) or inflammatory lesions (antibacterial agents and antibiotics). A principal goal of therapy should be reduction or elimination of the precursor of all acne lesions— microcomedones. For all health conditions, the nutraceuticals are individually tailored by the Health Renewal Doctor. The doctor will decide- based on your history, physical examination and blood tests what would be the best for you and your specific needs and/or deficiencies. It cannot be overemphasized that one must not self-medicate. Self-Medicating is done when a person takes prescription medication or nutraceuticals on their own without a doctor's supervision and/or consent. By not having a physical examination and blood testing done by a qualified and practising integrative medical practitioner, you could be not treating vital deficiencies or conditions such as elevated testosterone levels, or polycystic ovaries. In addition, there is no single supplement or, topical product prescribed to clients as there is no magic bullet that can support all the essential nutrients that one's body needs. Today's food is not functional and we need to supplement in order to maintain optimal bodily functions and nutrition. If you have Minimal acne (see definition above), you can come into one of our branches and our qualified and knowledgeable staff/ therapists will advise you on topical home therapies. If you want to have in office treatments such as a peel or Microdermabrasion, then please make an appointment with one of our Skin Renewal Doctors. HOWEVER if you have MILD to MODERATE acne, then you will need to make an appointment with one of the Skin Renewal doctors for a full evaluation. If you do a treatment, the price of the consultation comes off the price of the first treatment. NB: If you have SEVERE acne, you WILL have to see one of our Health Renewal doctors for a full evaluation which will include laboratory / blood testing. How does one prevent acne? Avoid the sun as overexposure to the sun can worsen acne, and cause post inflammatory hyperpigmentation (PIH) of inflamed lesions. Use cosmetics sparingly. Use only hypoallergenic, breathable cosmetics such as Lycogel concealer and foundation. Wash face gently in the mornings and at night with unscented, oil-free cleansers and keep the skin clean. It is important to remember: Acne is not caused by dirt. Avoid scrubbing inflamed skin as this will make acne worse and spread the infection to larger parts of the skin. Resist the urge to squeeze, scratch or pick at acne lesions. Let them drain when they are ready. Causing trauma to the skin will result in potential scarring and worsening of the condition as infection spreads. Young men who suffer from moderate to severe acne should use a new razor blade every time they shave to lessen risk of infection. It is important that men avoid alcohol-based aftershaves. If possible, use herbal alternatives that include essential oils of lavender, chamomile, or tea tree oil to sooth the skin. Eliminate foods which are high in fat, hormones, and iodine. Ensure your diet consist of a wide range of whole, natural foods, especially raw foods. Avoid processed foods with additives and trans-fatty acids. Drink adequate liquids, especially pure water and green tea, which helps to flush your system and keep the skin hydrated. I have been to Skin Renewal Morningside twice for my treatment. The ladies at reception are very helpful, they always welcome me with a smile and offer tea or coffee. My Skin therapist Bianca is an amazing person as I can vent to her about my personal life in between our treatments. She also explains every single treatment that we do, which is helpful. Review -Brighter, confident new me. Thanks to Skin Renewal - Irene, especially Ilona who has been an awesome therapist. My skin has dramatically improved, and Ilona & her team has taught me to care for my skin. The team is very knowledgeable and their proof is in my skin's appearance. Candice and the team at Skin Renewal Willowbridge are always professional and eager to assist. The treatments are customised and I have seen a tremendous improvement since beginning treatment. Durea my therapist explained each step of the process and what is meant to do to the skin. The therapist is very professional and well presented. The treatment was slightly painful due to extractions but my therapist explained that well in advance. Its such a pleasurable environment, I could feel myself falling asleep. Excellent service Durea, thank you. I enjoyed my facial and I was treated well. Durea my skin therapist had me fill in a form, we spoke about skin concerns and we took a before picture, so we can track progress for my next treatments. I did not experience any severe breakouts after the facial and extractions. My skin felt softer after the third day. She gave good advice on how to maintain it, what non-pore clogging make up to use. I look forward to my Mesoglow facial with her at my next appointment. I have been coming to Rene from Skin Renewal Bedfordview for six months now and my experience has been truly fantastic. All the treatments are explained to you, and the products used are amazing. Rene is very professional and will highly recommend her. Illona is a very friendly compassionate person. Assisted me with extra information on how to care for the affected areas on my skin after my deep cleanse facial. I will definitely visit her/the branch soon again. I have been struggling with hormonal acne since my pregnancy. Luckily I started going to Skin Renewal for facials followed by PDT and it has made a massive difference, don't know what I would have done without them. I can't recommend Skin Renewal enough. Nobody can compete with their service and treatments. Jess and the whole team here are INCREDIBLE! I have had different therapists treat me throughout my journey at Skin Renewal and they have all been so professional. The best part the way I am listened to and really heard. I feel very comfortable here and feel that this plays a huge role in the healing process. Hellen, you are simply amazing!! Ive been with skin renewal for 7months going onto 8 and I am certainly more confident than when i first walked in for my consultation. Hellen is such a warm, friendly lady. Not only does she give me all of her time and patience during our sessions but she also gives me thee best foot massages!!! She knows exactly what my skin loves and how to make me feel like a million bucks every time I leave. Also a big thank you to Dr Nadira Bhamjee for giving me the best treatments! Keep rocking my dear Hellen!! Your love and pride in your work is most certainly evident through your touch. I found the acne subcision treatment interesting and for the most part painless. I felt a little swollen afterwards but it wasn’t noticeable when I looked into the mirror. I felt normal in no time, I just had a little headache during the procedure which went away shortly after the treatment. The results were smoother skin. When the treatment was finished I went back to work without any problems. Dr Lestonn has changed my life by changing my skin! I had severe post-pregnancy hormonal acne, despite healthy eating. I was told by dermatologists to take extremely strong medication if I wanted it cleared, but I knew that had terrible side effects. I had heard about Skin Renewal and decided to visit. Dr Lestonn was empathetic, and patiently explained the underlying causes of my problem and outlined the process ahead. I decided to trust the system and stick to all the supplements, skin care products and facials advised. The prices were surprisingly affordable too. Within three months I had new baby soft skin! It has given me confidence and I even feel happy wearing no makeup again. It sounded too good to be true, but there is such integrity behind the skin renewal process. Thank you, Dr Lestonn and Skin Renewal for caring and making a difference. I am in love with my new skin! I am really pleased with the treatment I am receiving. It's good to see results when you have invested in a certain routine and products. More-over I am very happy with the treatment I received from my therapist Kayla, especially the advice she has given over the past few months in terms of effectively dealing with my skin. I appreciate the comfortable environment she has created, especially for people with skin conditions. It's very east to be self-conscious but to gave a great therapist helps. Therapist was very friendly and helpful . Explained all the steps as she was doing the facial . also gave me good advice on how to treat and care for my break outs . I did feel like an individual rather than a mere client coming in for a treatment . Review -Effects of Mango Peel! The days after my Mango Peel treatment my skin felt much smoother than before. I also noticed the texture being more even. I'm looking forward to the result of further treatments! The treatment helped a lot with my acne problem and I feel refreshed. My skin feels alive and renewed. I would definitely recommend this treatment to anyone dealing with acne and scarring. It is not painful at all, you can nap through the entire treatment! Review -Treatments speak for itself! My treatments with Liza has always been a pleasure even where pain is involved. Liza is professional and really cares about her clients. She has always satisfied and even exceeded my expectations. There is nothing negative which I am able to say. I'd like to think that the results of her treatments speak for itself. Review -Best facial I’ve ever had! This is my fourth/fith time here and it's because it's the best facial I've ever had. Liza cleans even the faintest hint of a blackhead and proceeds to masks, massage my face and neck leaving me feeling heavenly! Review -I am a happy client! First time coming to Skin Renewal I was welcomed with warm hands, the service was brilliant. The treatment does help a lot, I saw the difference in 2-3 months. Landa is the best therapist ever. She helped me a lot and now I feel comfortable in my own skin, all the confidence is back because of the best treatment she was giving me. Brilliant afterglow and very relaxing treatment. Highly recommend this salon. Review -Great results for my acne and skin tightening! Review -Brilliant service from Somerset West! Anneke (the Somerset West branch manager) and Lizanne (my therapist) are both brilliant and I am always happy to see them for my monthly visits for skin rejuventation. Review -Thank you, thank you, thank you! Amazing experience and Melissa was an amazing therapist! The treatment was relaxing and my skin feels clean, it glows as well. This is my second treatment with Liza, I will certainly be returning. Although a deep cleanse facial sounds like a bit of a torture it was an absolute treat. The most relaxing and enjoyable experience in a long time! Thank you Marzet and the rest of Skin Renewal Constantia team! Looking forward to my next visit - hopefully very soon! I've had an awesome experience, my skin is looking and feeling 100% better. I walked in feeling a bit unsure of what to expect, but when I leaft with confidence levels boosted, I know that my skin is going to look amazing. Thank you to Marzet at Skin Renewal Constantia. I am completely happy with the results of my treatments. Review -I give Landa 10/10! Landa is sensitive, caring and very professional. I give her a 10/10. Always makes me feel special. The staff at the Irene branch are fantastic. I am always welcomed with a smile and thus a very comfortable and processional atmosphere is created. My therapist Landa, is very knowledgeable and explains procedures and post care with patience and concern. She is very friendly and I enjoy spending time in her company. I would highly recommend her as my preferred therapist. My overall experience with Skin and Body Renewal has been excellent. The treatment has definitely helped. My therapist Bev has always been warm, kind and accommodating. I would definitely recommend Skin and Body Renewal to others. When I approached Skin Renewal my skin was at it's worst looking, because I generally have good skin. The staff was so friendly and helpful, always willing to answer questions. I see such an amazing improvement on my skin and my therapists always inform me on what she is going to do. I'm beyond impressed with the results I am seeing and would recommend anyone with a skin challenge to visit the branch. Review -Always friendly faces at Irene! All treatments have been explained thoroughly by the doctor and the therapist. Ilona is always friendly and welcomes any questions that one may have and she always takes her time to answer any queries. Ilona has been amazing, always supportive and helpful. Wonderful service and experience great results. Beverley has been an absolute pleasure, all treatments, side effects and recommendations are clearly explained and discussed. 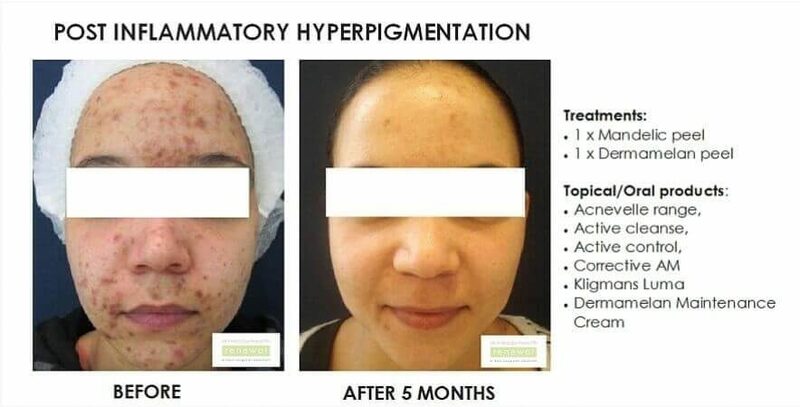 In conjunction with Dr Chrisna's diagnosis and treatments done by Bev I have seen a vast improvement in breakouts and pigmentation, is becoming less. The Lamelle home care range is awesome and I highly recommend Acnevelle to anyone battling with breakouts. Very good experience. Well trained therapist and good equipment used. A little uncomfortable, but that is expected. Review -Loving the Skin Renewal Experience! Professional, knowledgeable and loving the experience at Skin Renewal Irene. The staff know their field very well. Looking forward to a healthy, blemish free skin. The staff are very friendly and helpful. My therapist is brilliant and very good in performing the required treatments. The venue is tranquil and relaxing. Review -Love this branch and all they have done for me! Angie is extremely gentle and very attentive, always suggesting other ways to help improve the condition of my skin. 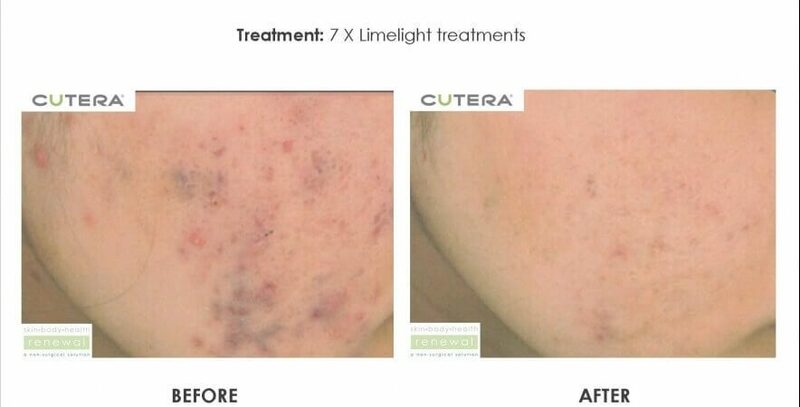 The treatments are incredibly effective and my skin has improved considerably. Excellent! The Best facial I have ever had, Bianca is an incredible therapist. Her over all ability, nature and professionalism is to be commended. The front office staff are always helpful and accommodating at Skin Renewal Morningside. Coming into Skin Renewal is such a wonderful and relaxing experience. Not only is the environment itself beautiful, but the treatments and products are of the highest quality. Liza is an incredible therapist and knows exactly what will work on your skin for your desired results. I have been suffering from acne for almost 20 years now. I have been on Roaccutane which worked for 2 years and then the acne came back. Skin Renewal has offered me a solution which has produced amazing results. 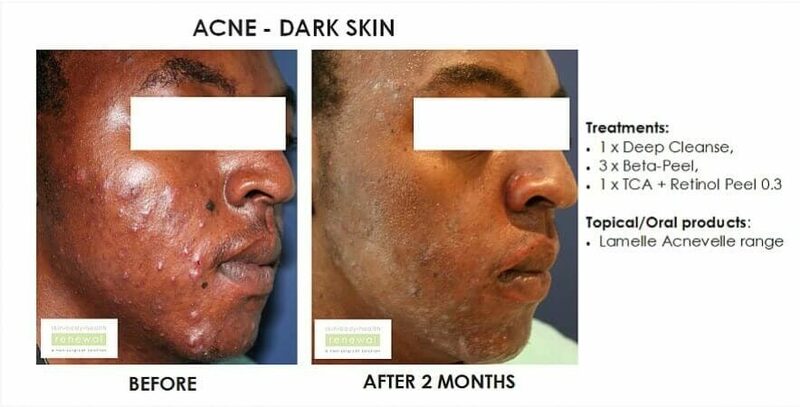 Including safe laser treatment for black skin. Doctor Burt listens to your feedback honestly and adjusts treatment where necessary. My therapist has been amazing. Overall world class service and results. The therapists are so professional and friendly. They inform me step-by- step about every aspect of my treatment. I was given specially tailored advice. The environment is relaxed and comfortable. The progress my skin has made has been more than I expected. I am so grateful that my skin is healing and my confidence is returning. Larushka has been an absolute pleasure. I look forward to my treatments every time. Review -I look forward to my appointments! Great experience whilst treating my acne treatments. Although the peels can be dreadful a lot of the time, overall I look forward to my appointments at Skin Renewal Parkhurst! Tammy het my dadelik laat welkom voel. Ek waardeer die professionele en vriendelike wyse waarop sy ons sessies hanteer. Elke behandeling is persoonlik en spreek my unieke behoeftes aan en Tammy doen baie moeite om 'n ontspanne en rustige atmorsfeer te skep. Ek sien uit na my volgende behandelings. 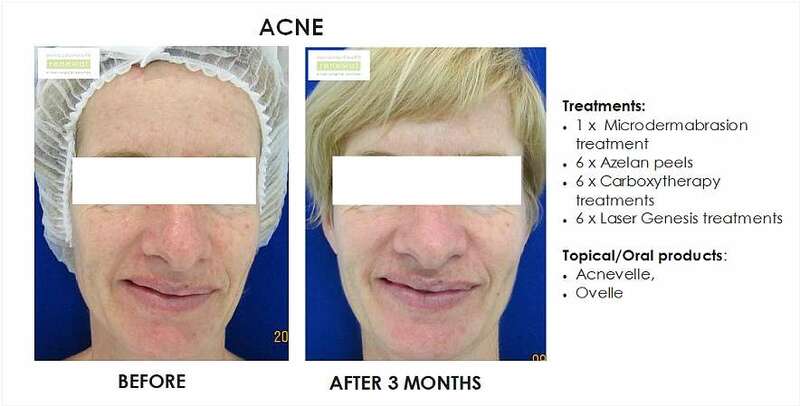 I have received excellent service from my therapist, Nicole, and have had some really pleasing results in treating my Acne since I first began my treatments here at Skin Renewal. I have had on peel so far and have already seen the results. The products really work and makes my skin feel refreshed and smoother. Having been on roacutane twice, and still suffered with read about acne, I thought there was no hope for my skin. However after coming to skin, body and health Renewal, I'm so pleased with the results. I wanted a quick fix and nothing was helping but after some months of coming for treatments I began seeing a difference in my skin. Even though I still have a long way to go, I'm so glad I started. I'm also grateful for Cheray Bedfordview Therapist I admire her work ethic and professionalism and the fact that she always goes above and beyond for her clients and put me at ease from the time I started. Kelly is Awesome! She takes care with each treatment to ensure that my needs and concerns are met and addressed. Always professional in her approach to everything she does at Skin Renewal Parkhurst. Review -Such a blissful experience! The Dermaquest Pumpkin Peel treatment tingles (but in a good way) and left me feeling like I have brand new skin. The accompanying facial and massage were delivered with care and skill from Dourina who made me drift off to sleep with relaxation. Would highly recommend it! Everything from day has been amazing to me, good service and the staff and doctors are friendly and explain in detail what they are going to do for you. My therapist, Andrea, is so amazing and understanding but mostly friendly. She will go the extra mile to see you happy and have good results on your treatment. I'm happy and the results are excellent, I cant believe when I look at myself in a mirror everyday. My skin feels awesome and clean! Liza is always amazing and the head massage at the end is super relaxing. Great and very accommodating staff. Overall my experience at Fourways Skin and Body Renewal has been very good. Candice is brilliant at attending to the needs of a client. She always does a pre-check to see where my skin is at and adjusts the treatment accordingly. Thank you for the great service. Always helpful, kind and understanding. I will recommend this branch to everyone. Review -I can see a noticeable difference, thank you! II am very happy with the support and guidance to achieve better skin quality. I can see a noticable different after only 3 months, thank you! Review -One gets the sense that she truly cares about her clients…. Liezel is a truly brilliant therapist, always lovely and pleasant to deal with. One gets the sense that she truly cares about her clients. I'm also very happy with the way my skin is looking and find that although the treatments are not cheap, they are worth it! Review -Tammy is baie behulpsaam! Einde laasjaar het ek gesukkel met my vel, ek het geen kennis van velprodukte nie, en Tammy het voorgestel dat ek op NeoStrata gaan. Sy was baie behulpsaam en het vir my samples gegee en het deurlopend gevra hoe my vel voel. Na die proeftydperk het ek die produkte gekoop. Ek is baie gelukkig en dankbaar dat Tammy deurlopend deur die jaar my vra oor my vel toestans en altyd nuwe voorstelle maak.